No doubt these latest changes to the AC45 World Series and the rules will spark plenty of debate. The impact on the involvement of emerging sailing talent in the series for one. The challenges faced by teams for funding and concerns to how many teams will be race ready with their AC72's in time for the main event in 2013. Exciting times ahead indeed. In the latest news from San Francisco the AC45 has been chosen for all America’s Cup World Series events. The event organizers and the teams both agree that the AC45 wing-sailed catamaran has exceeded all of their expectations. The recent AC45 test period produced two major results: outstanding on-the-water racing for the teams and superior television images for spectators. 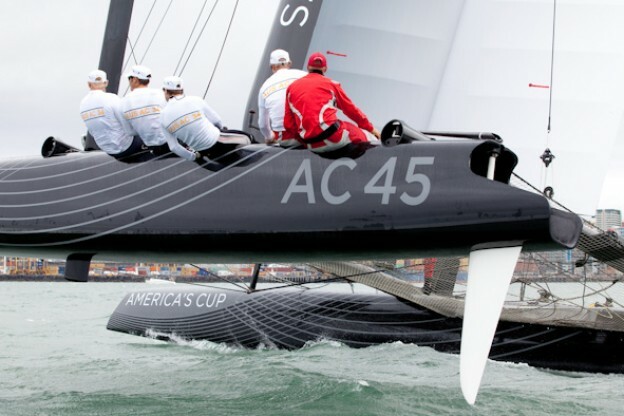 With that in mind, the AC45 today was confirmed for use in all America's Cup World Series events leading into the 2013 racing season. Using the AC45 in all AC World Series events instead of switching to the AC72 in season two was one of several changes voted on by America’s Cup competitors on Tuesday. This move also provides teams with another opportunity to manage competition costs. The larger AC72 is expected on the water from July 2012. Teams will work their AC72’s and race in the AC World Series leading into the Louis Vuitton Cup, America’s Cup Challenger Series, and the 34th America’s Cup Finals in San Francisco. The extended time-period for the debut of the AC72 allows teams more time for development of the boat. The race format and scoring for the 2011 AC World Series have also been released. The format will include a combination of Fleet and Match Racing with winners for each as well as an overall winner that will be determined on the final Sunday of the regatta. The AC World Series starts August 6, 2011 in Cascais, Portugal. Teams will consolidate their websites into www.americascup.com by July 1, 2011.